Need more information about booking Property 9627107 ? Looking for the ideal self-catering holiday cottage? Harbour Heights can offer you a luxury 6 bedroom self-catering cottage with breathtaking views & flexible accommodation for groups. This holiday cottage within the town of Dartmouth, Devon is ideal for families, couples or singles, also offering extreme luxury for 2. Harbour Heights is a short walk from Dartmouth town centre & waterfront with woodland walks on the doorstep. It offers luxury flexible self catering accommodation for groups of any size (up to 15); prices are individually quoted, based upon the numbers staying & length of stay Weekend/Midweek/Weekly bookings taken. Formal dining for 15 people. This self-catering holiday cottage is equipped for people with disabilities. The balcony at Dartmouth Harbour Heights, with its breathtaking river & sea views is the perfect place for popping the champagne for celebrations. There is a large garden & is dog friendly, with parking for 2/3 cars & additional street parking. 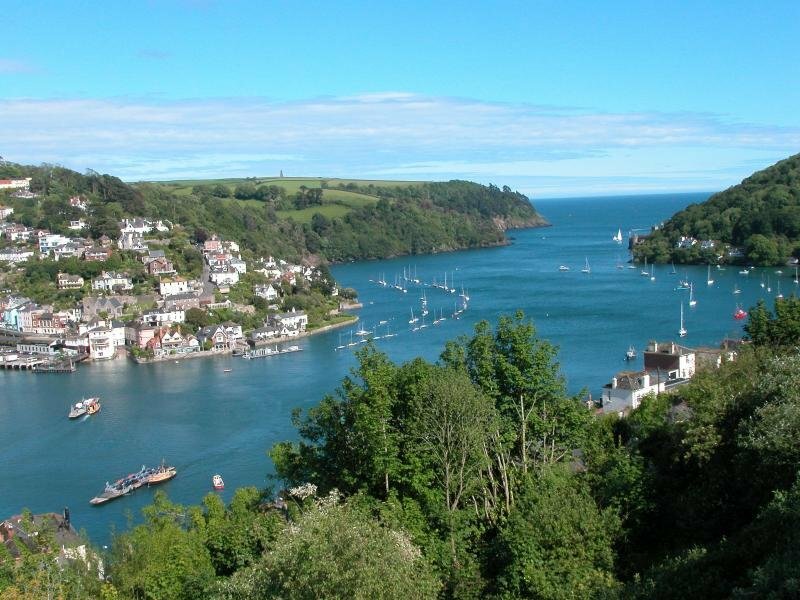 Dartmouth is a foodies holiday paradise, with a fantastic choice of restaurants, bistros, cafes and pubs, to suit all tastes & is well renowned for using local produce- you can in fact choose from 15 pubs & 22 restaurants or have meals delivered. Dartmouth Harbour Heights is an 'upside-down' house & comprises 2 main floors referred to as: 'TOP / GROUND FLOOR' & 'LOWER FLOOR' All rooms have spectacular 180° river & sea views with one exception, Bedroom 6, which overlooks woodland. The house is furnished using largely natural materials. The 4 single beds mentioned in Bedrooms 5 & 1 are moveable to any other bedroom. King-size double bed or twin beds, & 2 single beds. French doors. King size double bed or twin beds. King-size double bed or twin beds, bay window with desk, wood flooring. Stairs lead down to Bedroom 4 below. Parking for 3/4 cars in driveway, one additional parking space and on street parking. Wi-Fi access, 3 TVs/DVDs, full central heating, double glazing, all bedding & tea towels, hairdryers & mini fridges in bedrooms. NB: Towels are not provided. Dartmouth Harbour Heights is a non-smoking house. Dog friendly, Home-made meals can be delivered. Stayed with a group of friends for a long weekend as we were scuba diving out of Dartmouth. Ann (the owner) and Victoria (her assistant) were extremely helpful from booking the property through to our arrival. Bedroom arrangements are very flexible with rooms being able to be made up either as twins or doubles/king size beds. This was great for us as we had a number of individuals in the group as well as some couples. The house had everything from plenty of crockery and utensils in the kitchen through to the availability of wifi. It was also spotlessly clean. The views from all but one of the bedrooms are stunning and breakfast on the balcony in the sunshine is just so relaxing. The property is very close to the centre of Dartmouth but it is up a steep hill. It does however have parking for a couple of cars on the drive. i stayed at Harbour Heights with a group of friends, all couples, and everything about the trip was fantastic. Before the trip, Ann (the owner) and Victoria (her assistant) were extremely helpful with answers to our questions, but also providing proactive suggestions for us on what to do in the area. Little touches like this really help! Then on arrival, wow... The house is wonderful. Easily large enough for 6 couples, with 5 bedrooms looking over the river (which I will come back to!) and lots of communal space. The kitchen was well stocked with all cutlery and crockery you will need, and the whole house was spotless and in great condition. However the icing on the cake was the view, it is just stunning. You can see a whole panorama of Dartmouth itself and Kingswear, with the River Dart in between. I could have sat up there all day watching the world go by, and seeing the boats go up and down. I don't think I have stayed in any accommodation with such a good view as that. So in summary, a wonderful trip and I can't recommend high enough. Just two tips: 1. If you are organising the trip, make sure you grab the Flagship suite ;) 2. The hill to the house is the only challenging aspect. If you have mobility issues, then you might struggle to walk it - it is not far to walk, it's just very steep! However there is parking for cars so that will help. This year was our second year running staying at Harbour Heights-we love everything about the house and Dartmouth and surrounds area. The house has the best views you could ever hope to get of the beautiful River Dart and Devon countryside beyond the river-we stayed as a couple and used rooms that offered those great views whatever you were doing. The house is the best equipped holiday rental let I have stayed at-usually only the very basics are provided but not Harbour Heights it has EVERYTHING and ticks all boxes in our opinion for a great holiday break (and we are fussy). We will definitely go back for a third time soon!! This is a home from home with a fantastic view. Well equipt, plenty of space both inside and out. Clean and comfortable rooms and no need to go anywhere if you don't want as the view cannot be better. You can see the naval college across the hill on the left and watch the boats until they go out to sea on the right with the town and the estauary below. Walked across to the woods and took the jubilee way down into Dartmouth and back up to the house starting up the steps by the lower ferry. A very calming, enjoyable, pretty, relaxing place to stay. I/we look forward to returning. A great house with fabulous views in a good location, hills a little steeper than expected so I wouldn't recommend for older people or people with disabilities. A very well equipped house, plenty of cooking utensils and crockery, plenty of seating and beds, the outdoor space is a good size but on a hill so tricky to utilise, however it has a good sized balcony. A great house for large groups with very versatile sleeping arrangements, very easy booking process and the owner is very helpful and easy to contact. I would definitely stay again and would definitely recommend. We had a 5 night stay at Harbour Heights, it was just perfect for us. Plenty of room for everyone, a well equipped kitchen with everything you need. The bedrooms were spacious and comfortable. There were 12 people in our group and we never felt like we were on top of each other, there are lots of places in the house to sit and relax for everyone. The balcony was everyone's favourite place for relaxing with a glass of wine, the views are amazing, you never get bored of watching what's happening on the river. There is plenty to do in Dartmouth too- the Steam train/boat trip/open top bus is a great day out (known as the round robin). Our children also enjoyed some crabbing from the harbour wall, this was brilliant fun and there are lots of crabs to be caught! Eating out was also good- the rockfish restaurant for fish and chips comes highly recommended All in all this is a great place to stay and I would definitely recommend this to anyone thinking of visiting Dartmouth. We would all love to stay again! Harbour Heights, as usual, came up to all expectations. Fabulous views, comfortable accommodation. My room had panoramic views up & down the river & out to sea. Just had a wonderful few days at this amazing house and location during the Music Festival. The house and rooms are beautifully appointed . The balcony overlooking the whole of Dartmouth is the best place to relax and watch the world go by! The house is very comfortable and all the bedrooms are spacious and have fantastic views. We took the Paddle boat trip up to Dittisham which was very enjoyable and another sunny day a short car journey to Blackpool Sands where there is a great cafe. If you’ve already booked, go to Manage your booking to view Ann the owner's contact details or send them a message. Or send Ann (the owner) an inquiry through the Contact the owner/manager form if you’d like a quote or more info first. When you pay online through the Ready to book? form, a booking request is sent to Ann (the owner). You’ll find out within 24 hours whether they’ve accepted - no money will leave your account before then. Use the Ready to book? form to pay provisionally online. You can pay by credit/debit card or PayPal. Ann (the owner) will have 24 hours to accept the booking and no money will leave your account before then. You’ll need to contact Ann (the owner) to do this. Send them a message in Manage your booking or through the contact form on this page. You can request to change the dates or number of people on your booking via the Manage your booking page. To change your dates use the Edit booking button. If you need to change the number of guests staying then send Ann (the owner) a message. If Ann (the owner) agrees, they’ll send you a revised quote outlining the changes. You can review and accept/decline this from the Manage your booking page. You’ll have 48 hours to take action before the revised quote expires.